If you are an IIT JEE training institute, you have to ensure that the students are fully prepared for the entrance exam. This involves taking exams as well as issuing reports or delivering results just like in IIT JEE examination. The IIT JEE entrance is divided into two parts. First is IIT JEE Mains and the second is IIT JEE Advanced. In the first exam, candidates have to attempt 90 multiple choice questions while the second exam is divided into two test papers. The IIT JEE Advanced answer sheet is in the OMR format. Both papers (Paper I and Paper II) have three subjects (Mathematics, Chemistry and Physics) even though they have different layout or structure. With the OMR software, training institutes and colleges can help students to practice on the OMR sheets and provide results in the format similar to the actual exam. This will help the students to understand how to answer correctly as well as how the scoring is done for the IIT JEE Advanced examination. With the OMR software, you can generate two types of results or reports for IIT JEE (Advanced). One is paper-wise mark list and the other is subject wise mark list. Let us look at the details of both these report formats. Using the OMR software, we can create a similar environment for students to practice so that they are fully prepared for such high-level exams. By using similar OMR sheets and format, training institutes and organizations can train students on how to appear for these exams and teach them the scoring system so that they can secure maximum marks. The score results or reports for IIT JEE Advanced can be presented in two formats using the OMR software. It will contain columns for candidate details like name, roll no, batch, etc. 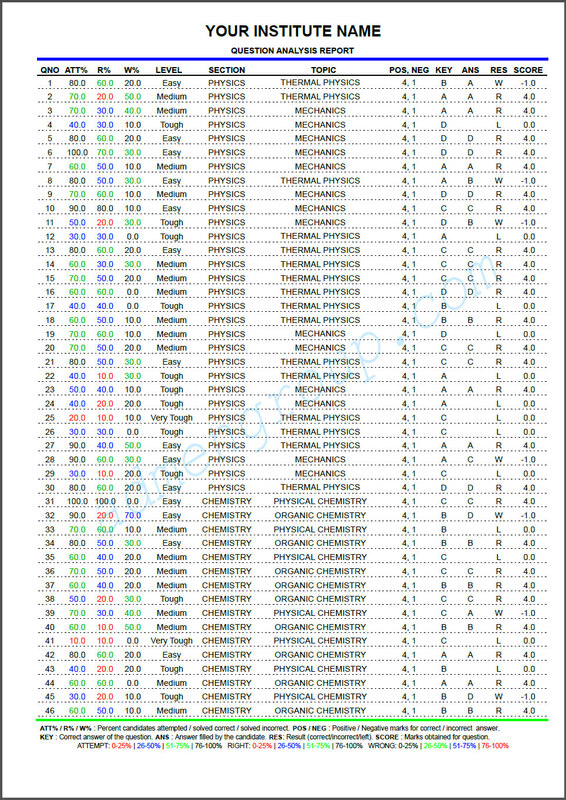 Each of these subject columns will have sub-columns for scores of Paper I and Paper II and its total score.